Loomis, California - Motion Pro, Inc. is proud to announce its continued support of TEAM USA and their racing efforts in the 2018 International Six Days Enduro in Chile! In addition to cables, tools and controls, Motion Pro provides every Team USA rider with a custom MP KC66 Tool Pack to aide them on the trail and between tests. 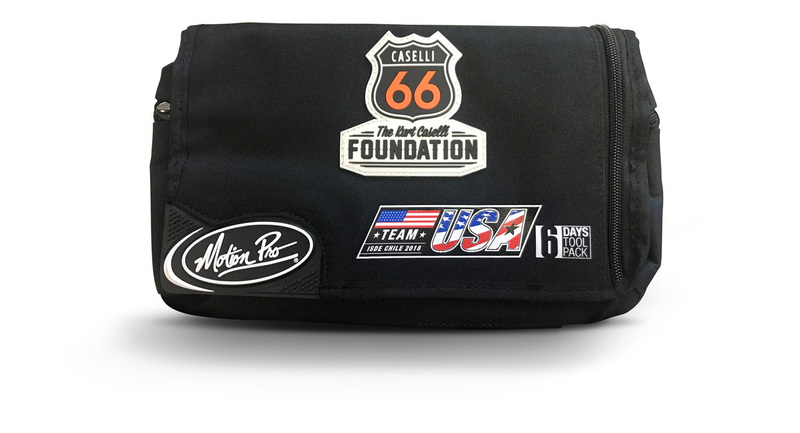 This special KC66 Six Days Pack is a nod to Kurt Caselli’s spirit, dedication and pride representing Team USA in ISDE competition. The design of this pack was heavily influenced by Kurt himself and feedback supplied by fellow team riders. A production version of this pack is still available for sale through Motion Pro directly here: https://www.motionpro.com/product/21-0024 For every pack sold, Motion Pro donates a portion of the proceeds to the KC66 Foundation to help promote off-road safety. 2015 was the year that Motion Pro officially released the Motion Pro KC66 production pack and was advocated by United States’ rider Ryan Sipes’ finish with top individual honors and gold medal. In 2016, the United States Trophy Team (Taylor Robert, Kailub Russell, Thad DuVall and Layne Michael) would follow suit in Spain by claiming the United States’ first ever overall victory; Taylor Robert would also claim individual top honors that year. Many more riders and teams have ridden for the United States over the years, earning both individual and team awards. Motion Pro has been proud to be a part of our country’s racing efforts for decades and look forward to seeing what the men and women can do in the 2018 International Six Days Enduro in Chile. Best of luck to our riders and be safe!